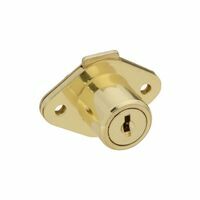 Keyed locking unit for added security. Fits 7/8" hole. 5/16" bolt throw. 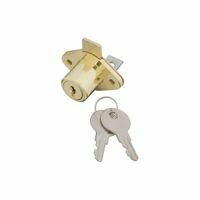 Includes 1 lock, 2 keys and installation screws. Stainless steel face. Plated diecast housing and steel cams can be mounted to metal or wood doors and drawers from 13/16" thick. 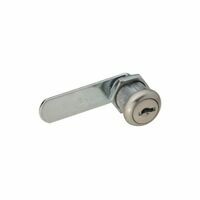 1-1/8"D x 2"L. Keyed locking for maximum security. Uses Yale Y-13 keyway. 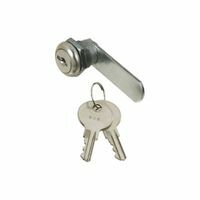 Includes 1 lock, 3 cams, 1 trim collar, 1 spur washer, 2 rotation washers, 1 lock nut, and 2 keys. 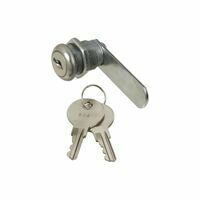 Diecast 3/4" cylinder with brass front plate, brass pins and spring steel locking clip. Multi-cam assortment to eliminate stocking individual locks. Replaces American, Florence, Miami-Carey, Bommer and Auth cams. All cylinders rotate 90 degrees counter clockwise to open. Includes 5 cams, 1 each with 2 keys. Prefix U on factory number denotes new Defender Security packaging. 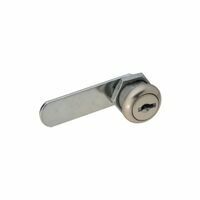 Plated die-cast housing and steel cams can be mounted to metal or wood door/drawer from 1/2" to 1" thick. Keyed locking for maximum security. Includes 1 each; lock, trim collar, spur washer and lock nut, 3 each; cams, rotation washers and keys. Prefix U on factory number denotes new Defender Security packaging.